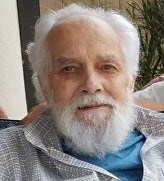 Ronald G. Andrews passed away peacefully November 16, 2018 under the care of Niagara Hospice and his loving daughter and caregiver, Gail. Born October 17, 1934 in Lockport he was the son of Dana and Maude (Stevenson) Andrews. Ronald was a Lockport Senior High School graduate running for the track team and also doing the high jump. He served in the US Army from 1955 to 1957 spending 15 months on Honshu – first at Otsu near Kyoto and then on the slopes of Fujiyama. Ronald was a member of the 16th Reconnaissance Company and was assigned to the north camp on Mt. Fuji. Upon his discharge in 1957, he joined Upson Company in 1965, retiring in 1994. Ronald enjoyed fishing, boating, riding motorcycle, camping, vintage car restoration, building, remodeling, and helping people any way he could. He also had a passion for animals, rescuing/rehabilitating cats and wild life. Ronald is survived by his three daughters, Jean (Thomas) Reasonover, Wendy Andrews, and Gail Andrews; two granddaughters Alexandra and Isabella Reasonover; and siblings Lois Andrews, Donna (John) Henning, and late Gary Andrews and Wallace (Margaret) Andrews; also survived by several nieces and nephews. Friends may call on Tuesday November 20th 4-8 PM in Prudden and Kandt Funeral Home, 242 Genesee Street, Lockport, where services will be held on Wednesday November 21st at 11 AM. Interment will be in Cold Spring Cemetery. Memorial donations to Wild Kritters of Niagara County, 3300 Saunders Settlement Rd., Sanborn, NY 14132 would be appreciated.